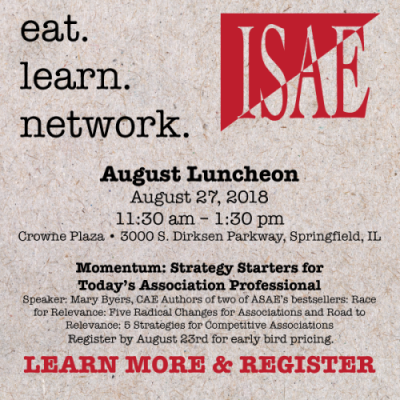 Early Bird Pricing Ends Today for the August Luncheon. Get Registered Today! Illinois Register, Issue # 32 (August 10,2018) adopted rule for the Department of Revenue regarding Use Tax – pages 15446 through 15457. USE TAX - The DEPARTMENT OF REVENUE adopted an amendment to Use Tax (86 IAC 150; 41 Ill Reg 10532), effective 7/27/18, affecting out-of-State retailers who display and sell items at Illinois trade shows. The rulemaking exempts non-Illinois retailers from having to collect and pay use tax on sales made to Illinois purchasers from their out-of-State locations (to which they become subject if they establish a business presence or “nexus” in Illinois) if they meet the following “safe harbor” conditions: the retailer attends no more than 2 Illinois trade shows per calendar year, is physically present and engaged in trade show-related activity at those events for a total of no more than 8 days per calendar year, and the retailer’s combined gross sales receipts from those shows in a single calendar year do not exceed $10,000. All sales made at trade shows remain subject to State and local sales taxes. Since 1st Notice DOR has clarified the procedure for submitting a special event tax collection report and added examples of when the tax applies or does not apply. Questions/requests for copies: Jerilynn Troxell Gorden, DOR, 101 W. Jefferson St., Springfield IL 62794, 217/782-2844. A link to the Illinois Register. You inspire your colleagues and volunteer leaders but who’s inspiring you? Momentum: Strategy Starters for Today’s Association Professional is designed not only to inspire you, but to share proven, adaptable strategies for creating momentum in your work for your association. Presented in bite-sized segments, Momentum takes a deep dive into the strategies working for associations today. Join host Mary Byers, CAE, author of Race for Relevance, as she explores thought-provoking concepts designed to help you keep your association’s edge. This three module course features video interviews, valuable resource downloads, case studies, and quizzes. You’ll also gain key insights from what Mary has learned as she’s connected with associations around the world. The modules are followed by a LIVE Capstone Event during which Mary will share bonus strategies and answer your questions. Momentum is designed for convenient consumption and is offered as a self-paced course, accessible anytime, anywhere. This online course is intended for senior leaders of membership organizations including Executive Directors and C-Suite Executives but any association professional will benefit from the self-paced course. How does the General Data Protection Regulation affect you?